In preparation for the reviews I’ll soon be posting of MacNeal’s second and third Maggie Hope books, I decided to start at the beginning by copy-pasting from Goodreads the review I wrote for her first – because it is very important to take things in the proper order. 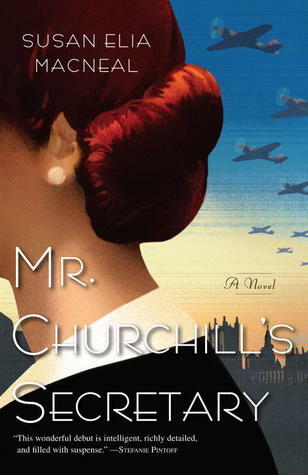 From Goodreads: “For fans of Jacqueline Winspear, Laurie R. King, and Anne Perry, Mr. Churchill’s Secretary captures the drama of an era of unprecedented challenge—and the greatness that rose to meet it. Personally, I loved Mr. Churchill’s Secretary. Maggie is quick and spunky, the supporting characters actually do provide support, and the story itself is light enough for holiday reading but intense enough to keep my attention for the majority of a twenty-four hour car trip. The history is well-articulated and atmospheric without being an oppressive infodump, though I suspect that some historical liberties were taken in the interest of driving the plot; however, it was nothing that would make my inner history buff growl. Honestly, I like seeing strong, feminist characters ahead of their time, and I absolutely love seeing strong, feminist characters who are strong because of their intellect. In short: fun story, fun characters, occasional deep moments, little to cause a mystery fan discomfort. It’s a short review, sorry. I wrote it a year and a bit ago, and on rereading it, I feel that the language I used was a bit dismal, considering that I do strongly recommend the book and the subsequent two in the series. In fact, I’ll likely pad out that review once I’ve had a chance to reread the book, but I wanted to get this up here before I got the next ones up here, which will be soon – and it’s important to take things in the proper order. Tagged espionage, literature, maggie hope, mr. churchill's secretary, mystery, review, susan elia macneal, suspense, thriller, woman detective. Bookmark the permalink.